That is the question I kept asking myself. As you know, our master bedroom has green walls with pink accents. Originally, I wanted the master bathroom to have pink walls with green accents. You know, to keep it cohesive but differentiate each room. The reason our bathroom is green is because I chose an awful pink. I mean seriously awful. It looked pretty and pale on the swatch, but turned to bubble gum on the walls. Anyway, we’ve lived with the bathroom as it is for three years and I’d like a change. Last week, while my parents were visiting, I decided I had enough of the green paint. Not that there was anything wrong with the green, I just wanted a change. So, on a trip to Wal-Mart, I bought a gallon of satin paint, color matched to Martha Stewart’s Pink Sea Salt. Based on my earlier pink paint experience, I thought it would be best to choose a color that looked lighter on the swatch. I figured the paint would look darker once on the walls. Before I could add color to the walls, I had to touch up the white trim paint. Easy enough. Now, bring on the (very pale) pink! Because I had only three small walls, I decided to cut in with a brush, skipping the annoyance of taping. I’m not going to lie, it kind of sucked to cut in along the mirror, going around the lights. The back wall was the easiest. A rectangle with two hook supports. I finished painting as the sun set, so here’s a glimpse of the color at night. Honestly, the color was fine. Definitely better than bubble gum. But, I didn’t love it. Going from the high contrast green and white combo to the lot contrast pale pink and white didn’t tickle my fancy. And, it was a more sweet baby girl pink than I had hoped for. Maybe I didn’t want a pale pink after all. Then, I realized I had a sample can of Valspar’s Market Flower, a bright pink. I added the whole thing to my gallon of Pink Sea Salt. It still wasn’t quite what I had in mind. Way too bright pink. I trekked back to the basement to dig out a gallon of grey/beige left over from the large basement bedroom. I added roughly three-quarter cups, hoping it would give the bright pink are slightly more aged look. The test swatch I painted seemed better, so I painted the walls. Again. Definitely brighter, but I’m still not in love. As for Ben’s opinion? He said he feels like a natural woman in there. This picture most accurately shows the color. I might try to add a grey wash, just to tone own the color. Or I thought about going into Wal-Mart to ask for just the colorants for a paint formula to add to my mixed up pink gallon. Do you think they’ll do it? If those options fail, because I don’t want to spend more money on a failure, I’ll probably be painting the bathroom green again. Gotta cut my losses. I’m my own worst enemy. I knew I should have gone with a pink I had seen in use somewhere. I wonder how many pink paint colors Nicole has gone through? Wild Aster, as seen in Nicole’s living room, is a pretty color. And the pink Young House Love used in Clara’s nursery seems somewhat moody. Based solely on the online samples, I’m also liking Odessa Pink and Chippendale Rosetone. Do you have any pink paint experience? Was it good or bad? Have you ever gotten just the colorants from a paint store? 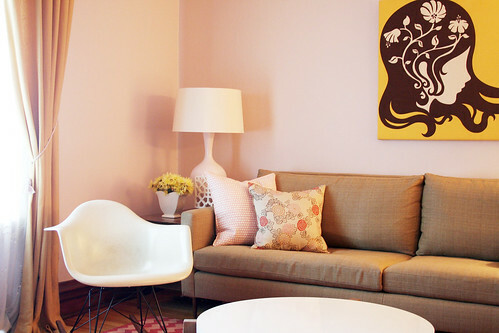 What’s your favorite pink paint color? Dunn Edwards paint has a color called rosewood which has some brown in it and makes it look less nursery like, maybe a lighter version of that. I don’t have any experience myself as pink is not one of my favorite colors (I say that as I’m wearing a pink shirt), but when I was a kid, my parents painted their bedroom pink. It was supposed to be so light it looked almost white, but it looked VERY pink when it was done. They never repainted because they didn’t want to spend more money either, but they hated it the entire time we lived there. I do know that the next people to live in that house painted that room FIRST. It is very cute. Very feminine. I am not a pink person at all but this really works for this bathroom. Oh and I love your bathroom fixtures. You should try Behr’s Bleached Cotton. It’s beautiful. May be an old color but they should be able to find it in the system and match it! Thank you so much for your opinions! Megan, I thought about that, but I DREAD going to Wal-Mart. I might have to, though. Jackie, Thanks for the color recommendation! And, as an update. I just went to Ace Hardware because I wanted to look at Ben Moore paint samples. Oddly enough, Wild Aster and Proposal (MIL and YHL’s colors) look nearly identical on the swatches. And, I talked to the manager and he said he could give me a small can of the colorants, but he’d be apprehensive because it couldn’t be color matched or added to in the future. Which I understand where he’s coming from, but for our small application, I don’t think it would be an issue. More details if we do anything to change the current color. Ben thinks I should leave it for a while and focus my energy on something else. Do you think that’s his way of saying he actually likes (gasp!) the color?!? Hahaha. Hi Kim, I saw that, but I still think it’s too baby pink ish. But, that was one of the colors I looked at. And, thanks for the help! When I was 16, I was finally able to paint my bedroom (it had been white for the 12 years before that). I wanted a pink but my parents weren’t game with anything too saturated. The pink we “agreed” on was so light it actually looks white. I don’t have luck with pinks either. I’ve been using colors on the cooler spectrum lately. What if you used a tiny bit of your green to tone it down, since that was what Megan said to ask them to add anyhow? Or maybe a little more gray and a bit of white? I totally feel your pain on “to paint or not to paint”. We painted the closet in our art room and I feel like it’s TOO bold. I would love to see moonlight white in there. But if you are in need of pink, there is a pink that I used to use all the time for client’s – “elephant ear” – let me look for the number! It’s not just pinks. I recently went through the same struggle with grays, and last winter it was yellows. The people at my Benjamin Moore store finally refused to add just a drop of this or that colorant, because it could never be matched and there was no guarantee that I would get the color I wanted. Those paint chips are pretty useless for me to see the grand color, and don’t even try to pick something online. I finally resorted to getting sample pots of the most likely colors and painting large pieces of foam core, which I moved around the room to see how the colors looked in different positions. I didn’t have the samples made at BM because they are $$$. Instead, I had colors matched at HD, where the samples are much less. This may not be the cheapest way to get the color you want, but it is the most likely to give satisfaction. Good luck. Cait, I could try that. I hadn’t even thought of that. Doh. Sometimes you just need a second (or 3rd, or whatever) opinion, you know? I have had so many “Why didn’t I think of that?” moments recently. I think I tend to stick to muted colors, too. (Well, I guess the art room and bedroom aren’t that muted. Maybe muted and/or light.) I ordered an RH swatch book recently and discovered that it is very similar to some of our colors. And the ones that aren’t similar are similar to the PB/West Elm colors by Benjamin Moore. Also, the sample cans from Lowe’s cover a 4×4′ area. Not sure about the ones at HD. Oh, and if sample cans don’t work out you could get a quart instead. I think those run abot $15 (which is the same as about 5 sample cans, but 10-15 cheaper than a gallon). 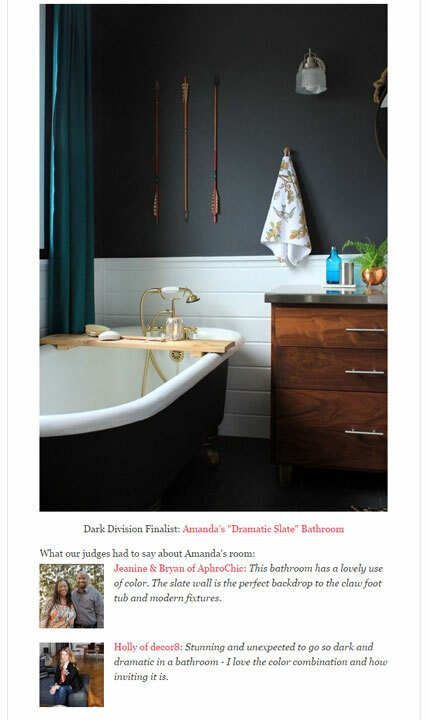 I am curious to know what color the green in your Master bath and bedroom actually care? I love it (looking for new colors for the bedroom myself).